This is a skill game in which you will get to play on a very dangerous island filled with monsters. 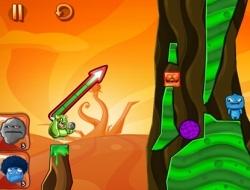 There will be lots and lots of levels in which you have to destroy the monsters by throwing your minions at them. Some minions are very sticky, others explode when they rest, some are really heavy and they are good for pushing things and finally, some of them will be very powerful bombs that explode on impact. Set the aim and trajectory of each throw after you have chosen what minion to fire. Depending on the scenarion you will have to use different ones each time. Try to get three stars for your play if you want to get a nice high score at the end. With the points you earn, you can buy different monsters of your own that will throw the bombs. Use the mouse to set the aim and power and also to select your minion. Monster Island 0.00 between 0 and 10 based on 0 votes.